Pack all your beach essentials and look stylish too. 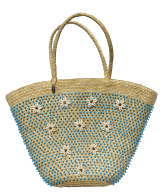 INCA Beachwear and the exclusive Jumby Bay, A Rosewood Resort in Antiqua now bring you the new Jumby Bag. The turquoise beads, white shells, and raffe material are reminiscent of the Caribbean, yet so perfect anywhere there’s sand and sun.